Channel letters are ideal for businesses because they help you advertise day and night. Partners Personnel has multiple locations. We made a channel letter sign for their North Hollywood location and they wanted the same sign for their Valencia location. From the photo, you can see that this is a front-lit channel letter sign. Front-lit channel letters have translucent acrylic faces and we can virtually make the sign light up any color. The acrylic itself comes in many standard colors that you can choose from, and we also have many options for pre-colored translucent vinyl that we can use for the faces. If you want to match a specific color exactly, it can be digitally printed, but we try to stay away from digital prints for exterior signs as the colors will start to fade much quicker than when using pre-colored translucent vinyl or pre-colored acrylic outdoors. Many businesses with multiple locations will choose to have channel letters at their location, and you want to make sure that your signage is as consistent as possible. 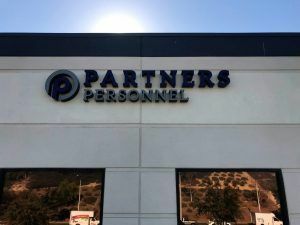 There can be restrictions depending on the landlord of the building, city regulations, and how we need to install the sign but we try our best to make sure that all of the Partners Personnel signs look the same. It’s ideal if we don’t need to use a raceway to install the sign as it doesn’t look as good as when a sign is mounted directly onto the wall. We did need a raceway for this sign, but luckily the building had a parapet wall so we were able to install the raceway behind the wall so it’s not visible. Channel letters are completely customizable and we create the highest quality signs right at our shop in Chatsworth, California. Call us today for your new channel letter sign.